Call (510) 926-6081 to inquire about our drain cleaning services today! $20 Off any service invoice, just mention you saw it on Gatelist! Are you in need of drain cleaning or plumbing services in Oakland? Perhaps you're in need of trenchless sewer replacement services? Intrigued by tankless water heaters? For all of your plumbing and heating needs, call the professionals at Albert Nahman Plumbing and Heating for drain cleaning, tankless water heaters, trenchless sewer replacement, and more today! "The Plumber Referred by Your Friends"
Choose the Oakland plumbing company that all of your friends trust – Albert Nahman Plumbing and Heating. Family owned and operated for 30 years, Albert Nahman Plumbing and Heating has helped Oakland, San Francisco and East Bay residents solve their most difficult plumbing problems, from clogged drain cleaning to trenchless sewer replacement, and more. If you need service for your tankless water heaters, there is no better company to call. We continually strive to meet and exceed customer expectations, that's why we have been the recipient of the exclusive Diamond Certified rating for ten consecutive years! Why Choose Albert Nahman Plumbing and Heating for Drain Cleaning & Trencless Sewer Replacement? At Albert Nahman Plumbing, we strive to bring the Oakland area the best in drain cleaning, tankless water heaters, & other services. It is our goal to provide you with the type of experience that you’d be happy to tell your friends and family about! We constantly train our team members with the most up to date repair techniques, technology, and products. Our pricing is straightforward and no match for the competition with no gimmicks and additional costs. Whether you are looking for trenchless sewer replacement service or would like to view our selection of tankless water heaters, we have you covered! Give us a call today and our trained professionals will work to get the job done right! We stand by our work, 100%. Plus, we love what we do! Providing Tankless Water Heaters & More to the Oakland Area! Albert Nahman Plumbing and Heating have been early adopters of energy saving products, particularly tankless water heaters. We have installed and serviced tankless water heaters in the Oakland area for over 20 years, and are specialists in all models. Tankless water heaters are a smaller option and can also save you money. Our tankless water heaters offer more space savings than any other heating system. They are also beneficial to the environment! Contact Albert Nahman Plumbing today for an estimate for a tankless water heater installation. Our tankless water heaters heat on demand, which makes it a huge benefit to your energy savings. We stand by our work, and offer a 5 year warranty on labor, plus a free 1-year check-up from the date of installation! Contact us today, we serve the Oakland area! Drain cleaning is one of the most common jobs we get calls for. From simple drains to sewer drains, we can clear common obstructions using our specialized drain cleaning and jetting equipment. Whether your drains are clogged by grease, roots, or something else, our expert technicians will perform a professional and thorough drain cleaning of your systems. No one wants to deal with the issues that come with a clogged drain. Contact our drain cleaning professionals today to learn more about how Albert Nahman Plumbing can help you! Clogged drains can be more of a problem than you realize. Not only does your sink back up and inconvenience you, but clogged pipes can also cause a pipe to burst! Leaving a clog unattended for a long period of time can lead to increased pressure inside the pipes. This pressure can cause your pipes to crack or burst. If that were to happen, the damage can be significant and the repair costs can pile up before you know it. Luckily, most clogs are easy to deal with, especially if you call us right away for drain cleaning services! Avoid the mess and the hassle, choose Albert Nahman Plumbing and Heating for all of your drain cleaning needs! Trenchless Sewer Replacement for Less Headache! Now-a-days, replacing sewer lines is a cinch. The days of complete excavation of the old sewer lines, tearing up your property and causing major inconveniences is over! With advanced trenchless sewer replacement technology, Albert Nahman Plumbing can replace your entire sewer system without destroying your property or creating a hassle for you. No more digging up your lawn, no more mess! We use trenchless sewer replacement solutions to reach the small access points. When you believe that there is a sewer problem, Albert Nahman Plumbing is the go-to plumbing contractor in Oakland and the surrounding areas. We use sewer video cameras in order to perform trenchless sewer replacement. This means that we do not tear up your yard or your driveway or any of your prized roses in the process! The benefits of trenchless sewer replacement are far and wide, the most important being that no damage is done to your property. Your sewer line can be under your yard, walkways, patios, and decks, making it a huge hassle to replace because you may have to damage parts of your property for it to happen. With trenchless sewer replacement solutions, there is little disruption to you and your family routine and the time it takes to complete the replacement or repair is drastically decreased. Trenchless solutions are also more cost-effective than traditional options. For more information, feel free to give us a call today! Our services include trenchless sewer replacement, tankless water heater installation, drain cleaning, and more. Our professional plumbing contractors have the capacity to handle problems both big and small. We serve residential clients in Oakland and the surrounding areas. We are equipped with the latest skills in order to ensure that your job is done properly and in the quickest way possible. If you need more information about our trenchless sewer replacement services, contact us today. Heater Repair and Maintenance Experts Here to Serve! Albert Nahman Plumbing and Heating is proud to serve heater repair and maintenance to the Oakland and surrounding areas. Whether your system is not functioning properly or you feel it is time to make a maintenance call, our factory trained technicians can come to your home quickly. Call us today to schedule an appointment! 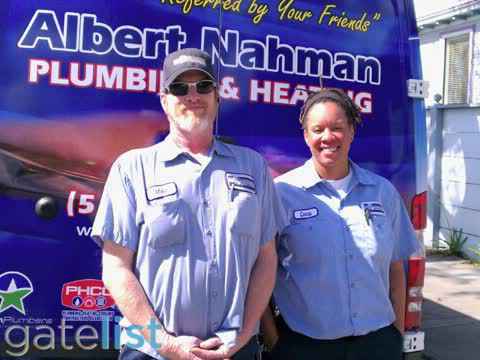 For over 30 years, Albert Nahman Plumbing and Heating has proudly served residents in San Francisco and the East Bay. Whether you need simple drain cleaning or are looking for trenchless sewer replacement services, we are the company to call! We even supply tankless water heaters! We look forward to working with you and helping you solve all your plumbing problems! Call us today at (510) 926-6081 for more information or to schedule service! Albert Nahman Plumbing & Heating is a full service plumbing company serving residents in the East Bay and the San Francisco Bay Area. Their range of services include expert repairs to existing plumbing water, gas and sewage systems, copper piping, water main replacements, trenchless sewer replacements and tank or tankless water heater installations. They also provide renovations for existing kitchens, baths and laundries. 24 hour answering service to take calls.